Visit Perge, an important city of ancient Parnphylia, settled by the Hittites in 1500 BC. People who lik archaeology will want to see this fascinating city gate. Make a visit to the great Apendos, hear its ancient history from your guide. Walk around the Manavgat Waterfalls, enjoy the view and take some outstanding photos. 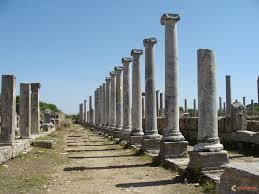 We will depart in the morning to visit Perge, which was originally settled by the Hittites around 1500 BC. We will visit the impressive colonnaded street, baths, nymphaeum and agora. See the fountain of the River God, where waters once poured down the centre of the city. We continue to Aspendos to see one of the best-preserved amphitheaters in the world, and the Manavgat Waterfalls. Finally a visit to the seaside town of Side for free time.